Appointment Reminder | How Texting Can Make Your Appointment Confirmations Easier! 09 Mar How Texting Can Make Your Appointment Confirmations Easier! So, you missed an appointment. But wait, you wrote it down…somewhere? Oh wait, maybe you scribbled it on the back of that bill you threw away? Or, wait, maybe it flew out of the car window? We have all felt the embarrassment of the dreaded “Hello, you were scheduled to be here…now” phone call. How can such an easy thing slip our minds? Turns out, it’s more common than you think! Not only is it tough on the person who forgot the appointment, but even more of a headache to the one who scheduled it. Lost time, productivity, and missed opportunity to work with other clients are just some of the repercussions associated with a customer or client no show. Service-based businesses, including law offices, clinics, and salons experience these losses on the daily, losing out on a lot of time and money…but, technology has a solution! Phone calls and emails are a great way to remind a person of their upcoming appointment, but an even better, more efficient solution is SMS texting. Let’s face it, the smartphone has taken over our lives and texts are the easiest way to communicate in a flash! Businesses are now using these capabilities for all sorts of consumer messaging today such as promotions, exclusive perks, and you guessed it! Appointment Reminders! Why is Text Messaging So Popular? Text messaging enables small businesses to combine successful marketing techniques with mobile and Web technology allowing them to interact with consumers in an entirely new way!The world can be filled with clutter and short attention spans. A quick and concise message is a great way to capture people’s attention, without a large process or login required. Reminding someone of an appointment or event, can be conveyed quickly, and being on a mobile device allows that person to save it in calendar or call the service if needed. 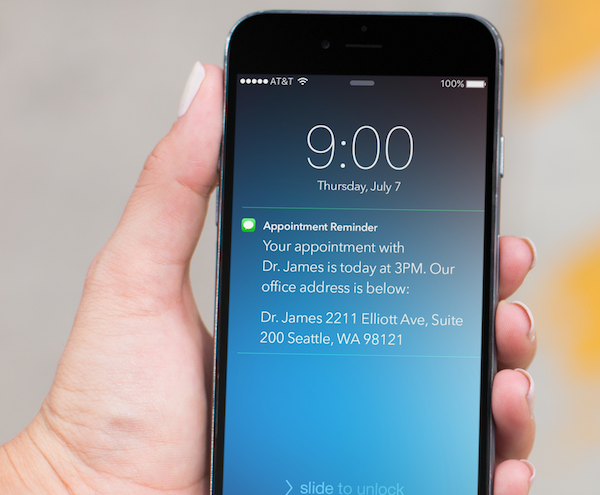 Appointment Reminders text message service, allows the recipient to either confirm, cancel or request a new appointment, and immediately alerts the service provider, so they know what to expect. All that in a matter of seconds. A phone call requires the person to stop what they’re doing and answer the phone. Most likely then, they will need to write it down somewhere. An email is also a great way to get information but will require a log in and internet. Some people prefer these methods, and it is that reason, Appointment Reminder has the phone and email option also, which can be used in conjunction with texting or individually. If you are like me, I like something to already be in writing, so the text is a perfect way for me to reference my appointments and commitments! While this reminder process is hugely beneficial for business owners, it is also a great way for customers to have a better grasp on their schedule. If you are human, you know that schedules change all the time. It is easy to change appointment on the text with a press of a button. Customers can also stop receiving messages whenever they please as they have a choice to opt out of the message and convey reminder preferences at any time. Nothing is worse than a no show. Now you have an hour to kill before the next client shows up! In that hour, you are losing money and wasting time where another client could be sitting in your chair. Imagine getting a notification saying that your client has cancelled, a day before their appointment. Why? Because you decided to give them plenty of time to confirm or cancel it by texting them a day early. The great thing is, if they ignore your first reminder, you can always send a call, email or another text to them anytime you want. So now you can schedule someone else in that time slot if its available, making your day as productive as possible! Don’t Believe Me? Try it for Free! Have I convinced you to try out SMS texting yet? You have nothing to lose as we do a free 30-day trial subscription for free! Just check out the plan that works for you and make sure to watch our tutorial video on how you can use text messages to reduce no shows as early as today!